The AD is a powerful lightweight pneumatic saw. It will cut thick, twisted horns easily, and it can process 200 beef per hour. The large blade will cut thick twisted horns easily. - Specially designed for low-medium production plants, with a hollow ground blade. - The 11" diameter blade will cut through the older harder horns with ease and can be sterilized simply and quickly. - The alligator jaws are self centering and the blade is visible at all times so that operator can enter precisely where he intends to. 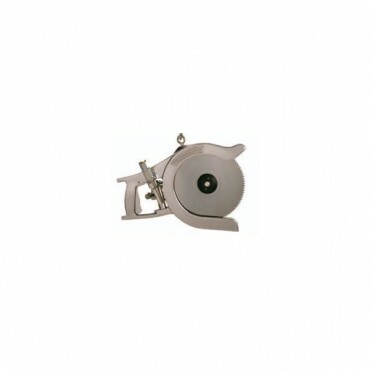 - The saw blade is completely shrouded offering maximum safety to the operator. - Compact design permits easy maneuverability and fast movement. - Dual control switch for operator safety.